At Penny Anderson Associates Ltd. (PAA) we have a team of hydrologists and ecologists who develop SuDS designs, define construction materials, work up appropriate planting specifications and produce management plans to ensure a cost-effective resolution to surface water drainage challenges. As a consultancy, we often work with drainage engineers to combine our skills in the development of optimal resolutions to drainage problems. 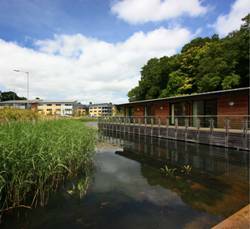 By having an ecological input at the early stages of a SuDS design we can ensure that the eventual system meets not only statutory requirements but also provides opportunities for ecological mitigation, landscape enhancements and recreational access to open space. SuDS come in a wide variety of forms but a large majority focus on the use of habitats such as ponds, reedbeds, marshes, wet woodlands and wet grasslands. These act not only to store flood waters but to process any pollutants they may contain before controlled discharge into receiving watercourses. In addition, habitat-based SuDS have other potential benefits, for wildlife, landscape and amenity, and can also contribute to sustainable development and environmental response to climate change impacts. 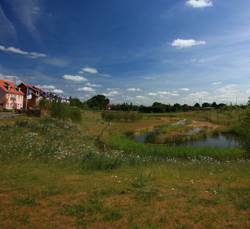 Although the design of SuDS requires a degree of drainage engineering, those based on habitats also require a refined understanding of the application of ecological principals. Without the appropriate level of ecological input into SuDS design, the systems run the risk of failure or end up generating onerous management requirements. The floods of 2007 created the biggest civil emergency in British history and were estimated to have cost the UK some £3.2 billion. The subsequent Pitt Review in 2008 recommended, amongst others things, that the competent authorities such as Natural England, the Environment Agency and Defra should work “with natural processes” in order to reduce flood risk generated by runoff from urban surfaces. These ideas are now enshrined in the Flood and Water Management Act (2010), which requires all new developments and proposals for site redevelopment to have in place an approved SuDS plan prior to any site drainage and development permissions being given. Sustainable Drainage Systems (SuDS) encompass a wide range of approaches for managing surface water in both urban and rural situations. 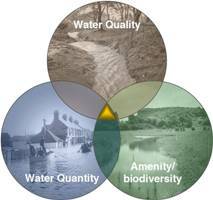 The main objective is to manage flow rate and volume but, alongside this, SuDS are also able to provide improved water quality and enhance biodiversity and amenity, as illustrated by The SuDS Triangle diagram (above).